Hayek said this about economics but I think it's applicable to everything we design. As an architect I have a front row seat to the limits of our ability to understand the consequences of our decisions, and I think it's fundamental. We get better at controlling for these unintended consequences, but we also seem to consume any advances by making our designs more complex (i.e. buildings used to be built with two or three materials, now it's literally thousands). A theme I've noticed this year across multiple disciplines is the tendency of systems to be exploited in ways their designers didn't foresee. Informal agreements go by the wayside and once exposed become part of its regular use. I've noticed this in politics, legal contracts, games, the news, internet forums, etc. Historically a popular example of this is the gentleman's agreement that US presidents abided by - the two term limit that George Washington imposed upon himself - then FDR was elected to a fourth term; something no president had ever done. After his death Congress passed the 22nd amendment which limits presidents to two terms. Examples from 2016 might include: news organizations inability to convince readers of their legitimacy in contrast to fake news, the US Congress's unwillingness to review the president's Supreme Court nominee or Federal Reserve appointees, reddit's inability to deflect gaming of their algorithm, and internet service providers willingness to become 21st century robber barons. It almost appears that it's en vogue to break with convention and subvert anything that isn't specifically stated or enforceable legally. If there's a take-away from me writing this it seems to be that as a culture we seem to be more accepting of this than previously. The spirit and intent of our contracts, systems, etc. seems diminished in relation to our ability to bend these systems to our will using their semantic deficiencies. The tendency of a system towards entropy is also a law of thermodynamics - which may also be why life exists, so maybe this is actually more typical than the reality we've been living in? Today is my first child's first birthday. I thought it'd be nice to document some of the changes in my attitudes and views over the last year while I'm still mentally straddling the line somewhere between not having a child and being a parent. Soon I won't reliably remember what not having a kid felt like in the same way that I can't really recall what being unmarried felt like. The love thing - it's taken time to develop. I'm skeptical of the claims of others to the contrary. My concern for children's safety and empathy towards parents who have kids who have been harmed or killed is greatly magnified. I'm surprised more parents don't retaliate violently against those who harm their children. Having a kid is surprisingly similar to having a pet - not a polite topic of conversation. The key differentiator is the ceaseless rapid progression with no plateau in sight. Kids are less homogeneous than previously thought. There's a strong possibility that we work too much. I've been noticing lately that I spend a sizable portion of my workday conveying information that gets misunderstood. Not just misunderstood like one of us didn't read the entire email, but literally the party I'm trying to convey information to doesn't have the requisite knowledge to really understand what I'm trying to get across. It sounds condescending - it's not meant to be. We all exhibit this, just in different knowledge areas. Below is a clip of the physicist Richard Feyman explaining the issue to a journalist who's just asked him a question the journalist can't understand the answer to because they don't understand basic physics, so instead of answering the question Mr. Feyman (a bit pedantically) explains the difficulty of conveying answers to someone who doesn't posses the requisite building blocks of knowledge in that area. Most of the articles I read everyday are on subjects of which I'm not an expert, but often they touch on knowledge areas that I've studied and have a degree in - which isn't that important but it's to say I've taken all the foundational classes. What strikes me is that often these articles that deal with technical subjects, the two most notable offenders are economics and nutrition articles, will deal with fairly high level concepts - the stuff of 400 level classes, but they often do so while misunderstanding the basics, the irreducible facts. You can't write a piece on a low carb diet if you don't deeply understand macronutrients. It'd be disingenuous. It's like me writing an opinion piece in a law case when I barely understand the difference between criminal and civil law. The internet is a boon for the intellectually curious but I often wonder if it gives us a false sense of knowledge. The traditional model of schooling is largely outmoded. Yet, it's difficult to accumulate the basic building blocks of a subject purely through our own research. That's changing with outlets like the Khan Academy and similar. It still leaves me wondering why we're so prone to this this type of error and how we can convey ideas to those outside of our knowledge areas. The piece that inspired this article, which I missed the boat in commenting on, is an article on economic inequality by Paul Graham. I admire Mr. Graham very much. His essay How To Disagree is essential reading, but I think he misses some basic points of macroeconomics in his inequality article. That someone who is so clearly highly intelligent and deeply introspective troubles me because it suggests this is something we are all prone to. The other day I was attempting to find photos and videos of me playing paintball. I played my last pro tournament at the end of 2007 and it's surprisingly difficult to find much evidence of it. I think it's largely because smart phones didn't exist then. Their adoption has been relatively recent and it's difficult to remember a time before them; the first iPhone was release midway through 2007 with the first Android phone, the G1, trailing at the end of 2008. This isn't news to anyone. My point in bringing this up is that two more shifts like this are underfoot, and much like smart phones everyone knew they were coming several years in advance. Once they happen it'll seem as obvious as the arrival of smart phones. The shifts I see are self driving cars and the dominance of solar electric energy sources coupled with a more distributed power grid. This is in opposition to other renewable sources and our current centralized generation system. No one will need to own a car. Cars sit idle 90% of the time. The greater the utilization, like any asset, the cheaper its use every time it's used. Related, this is Uber's actual plan. They're not a taxi company. They're a data company and they're building the ride sharing infrastructure for self driving cars. This is why their valuation is many times higher than the entire revenue of the taxi industry. Self driving cars will almost never crash. Currently about 30,000 people a year die in collisions in the US. Collisions will likely be treated more akin to airline crashes. They rarely occur and when they do they receive lot of media attention and the investigation is thorough. This will be an issue since people tend to have cognitive issues with ceding control and perceived danger. And no, there won't be a steering wheel. At some point people won't be allowed to drive on public roads because it's unnecessarily dangerous. The right to do so, while legitimate, will prove too costly to continue. Driving a car will be relegated to closed tracks only. Cars will travel closer together, think inches/centimeters, which means roads will get smaller and traffic will disappear. What will we do with all the excess space? It also means less road maintenance and traffic signals as we know them will go away. Gas stations, auto body shops, car dealerships, personal car insurance, lawsuits related to car accidents, traditional car companies, the number of mechanics will be reduced, medical personnel responding to crashes, etc. Cars will travel faster. On the face of it this seems like it'd make outlying suburbs more attractive, but telecommuting was supposed to do the same thing while in fact the reverse happened. Cities became more populated and suburban and rural areas less so. Telecommuting has made it possible to live a more nomadic life and non-privately owned self driving cars will further that. Cars will be electric. Why? There's a plethora of reasons, but mostly because it's quickly becoming the cheaper option. They'll also use less energy even though they travel faster. Parking lots and garages will largely go away. This may not seem like a big deal but they're expensive and take up lots of real estate that can be used for higher value uses. Much as just-in-time-shipping revolutionized logistics by removing warehousing from the equation why would a self driving car company want to idle an asset and pay to do so? Maybe during periods of low usage, but more realistically the cars will charge themselves during non-peak hours. Maybe they'll even flip the equation by acting as storage for conventional power, soaking up cheap excess power generation during off peak hours and flooding the grid during peak hours when it's financially attractive to do so. Public transportation will become largely defunct. I haven't read anything about this but I don't see how it won't be affected. Trains are massively expensive and public transit in general is a money loser (it's a political issue endemic to public transit). I don't currently see a scenario that makes fiscal sense. It'll be interesting/frustrating to see how entrenched interests fight this, but the coffin is already designed. Long commutes are proven to reduce life satisfaction. Since self driving cars will travel faster and you won't have to pay attention this should be mitigated to a large degree, so as a whole it'll make people who endure long commutes happier. Related to all the above is energy production and usage. Solar won the small scale renewable energy contest years ago and few have taken notice because it's happening slowly and there's a stigma attached to solar (PV, photovoltaics) from its early years. It's also been strung along due to backlash from entrenched publicly regulated energy company's outdated pricing models (charging mostly for usage instead of connectivity which is becoming the real product) and the fact that batteries haven't improved fast enough. The competition was and currently is: distributed natural gas, oil, gas digesters (waste to methane), wind power, hydroelectric, and to some extent conventionally distributed electricity but I see that as part of the same system. True geothermal and wave power generation has never been anything beyond niche. All of these systems will remain but solar's growth will eclipse them all by orders of magnitude. Why this is happening is due to a confluence of fundamental physics and cost issues. On the physics side of things conventional electric power plants have a theoretical maximum efficiency of 42% due to the Rankine cycle and most operate in the low to mid 30s, wind power has a maximum efficiency of 59% due to Betz's Law and current technology is already near that. Distributed natural gas is more viable but poses a myriad of health issues that are becoming less tolerated. Heat pumps are making conventional heating systems obsolete while induction cook tops are doing the same thing to cooking ranges both of which negate the need for running gas lines to buildings. Hydroelectric poses environmental issues which is why they're almost never built anymore in the US. 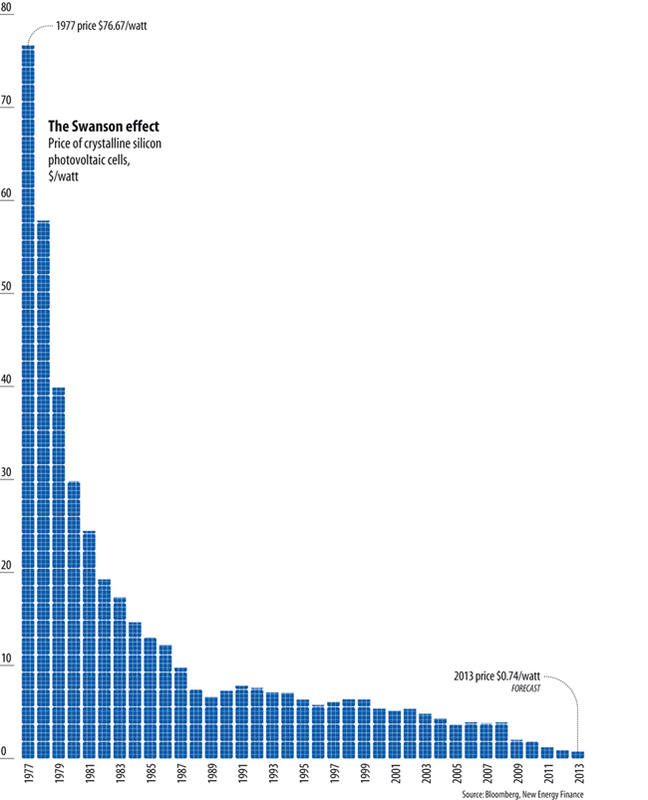 The list goes on, but the point is that solar efficiency is still in its infancy. There are huge gains to be made while contending technologies are already near their theoretical limits. The real breakthrough in recent years has been the cost of solar. It's plummeted to the extent that the barrier now is the labor to install them and the regulations surrounding attachment to the grid. A real world example of this is Tesla offering its customers free charging by building stations that run on PV. The brilliance of this is two fold. First, a car bought from Tesla includes in its price all the associated energy costs for the life of the car up front. That's not possible with a gasoline car. Second, PV's costs are almost entirely up front since there's almost no maintenance. Energy is a ruthless finance game and PV is a known quantity. Other systems currently have lower costs up front but unknown variable costs during their useful life. This makes them more difficult to finance. Energy is a much more nuanced discussion than self driving cars, so I'm leaving a lot unsaid since this is already a tome. The time frame for self driving cars is unknown but has already started. They should really start to come online in the next few years. The total dissolution of our current system may take multiple decades. I have no idea. There are a lot of interests that will be made obsolete and they won't go down without a drawn out fight. Solar is harder to predict but that should take far longer. I wouldn't expect anything too noticeable to happen in the next few years. I'll consider this tipped when the majority of conventional homes are being built with PV and net meters as standard. That could take more than a decade but the writing is on the wall.